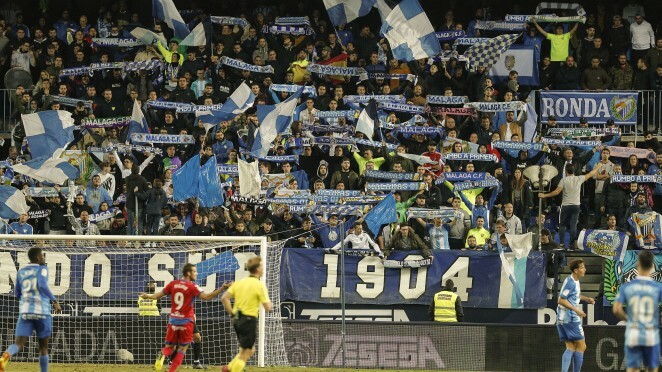 Málaga based the triumph against Numancia on two goals scored at the start of each half, certifying the power of Muñiz’s men at La Rosaleda. The Blue and Whites’ forward was named Most Valuable Player by fans against the rival from Soria. “Here at home we always have to win, and today we did it again”, he said. The Blue and Whites’ defender analyses the victory against CD Numancia and is now focused on points away from La Rosaleda: “We have to try and score points away from home, which is important to stay at the top”. The Malaguista striker was in the starting line-up against CD Numancia and was in charge of giving two goal assists in the match: “Those two passes helped the team to score all three points and that is why we’re happy”. The Málaga CF coach talks about the great work of his team. “Before the first minute was up there was strong pressure, ball possession and counterattacks” he affirmed. Málaga CF defeated CD Numancia, at La Rosaleda, on LaLiga 1|2|3 matchday 11. Two quick goals from Blanco Leschuk, both from a Koné pass at the start of each half, led to the sixth league win out of six at Martiricos. Juan Ramón Muñiz has announced the list of called-up players for #MálagaNumancia, kicking-off this Monday evening at 21:00. Midfielder Renato Santos and striker M. Koné are back, in respect of the last match in Elche. Málaga CF will host CD Numancia at La Rosaleda on LaLiga 1|2|3 matchday 11. The match between the Blue and Whites and Sorianos will kick-off on Monday at 21:00. The Malaguista coach held a press conference the day before Málaga - Numancia: “It will be a difficult game, in order to win we’ll have to perform very well”. The Blue and Whites returned to training at La Rosaleda’s facilities the day before the match against the rival from Soria. Harper retired at the end of the session with a slight sprain to his right ankle. The current Atlético Malagueño delegate developed a large part of his playing career with Málaga CF, although he was loaned out to CD Numancia during the 2001/02 season. The players and coaching team are buying tickets to contribute with the Club’s initiative, with monies raised from the #MálagaNumancia match tickets going to those affected by the recent floods. It was Malaguista goalkeeper Munir Mohand’s turn to hold a press conference today at the ‘Juan Cortés’ press room at La Rosaleda. “Numancia is a team that competes well and will make things difficult for us”, he says about his former team. Málaga CF is donating the full amount of ticket sales for the upcoming home game to those affected by the terrible flooding last weekend in the province. LaLiga 1|2|3 matchday 11 between Málaga CF and CD Numancia de Soria will be held at La Rosaleda. Valentín Pizarro Gómez awarded Blanco Leschuk (45') from Málaga CF y J. C. Sánchez (37'), Viguera (78'), Markel (87') from CD Numancia.